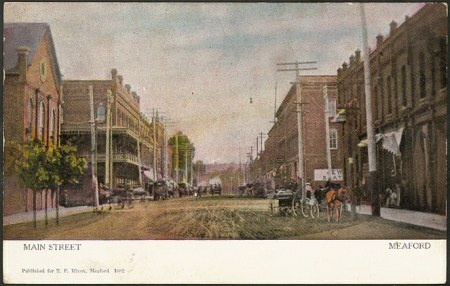 The scenes here capture a slice of Meaford history, circa 1910, some of which has been preserved to this day. 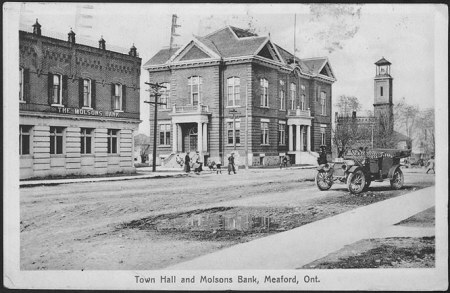 For a tour of Meaford past, via historical postcards, visit here. 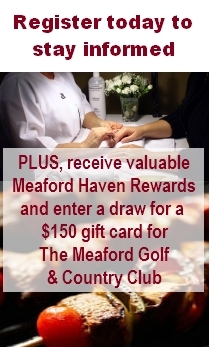 Things were hopping in Meaford this past weekend. 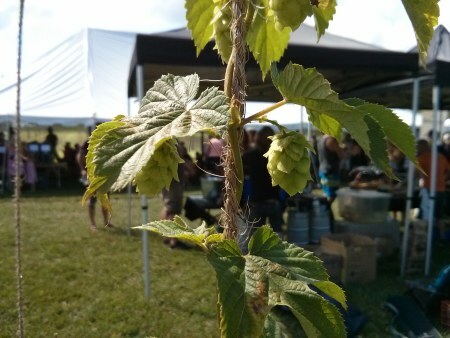 The third annual Bighead Hops ShinDig welcomed beer lovers, food lovers and music lovers to a family friendly event showcasing 14 craft breweries and cideries, most of them from nearby. From noon to five on Saturday, August 15, visitors sampled unique, sometimes limited edition ales, lagers and ciders, along with freshly made local foods, all to a live soundtrack of local musicians, including folk favourites Moonshiner’s Daughter. And Niagara College’s brewmaster program was on hand to actually begin brewing up a batch of pale ale, using freshly picked hops. 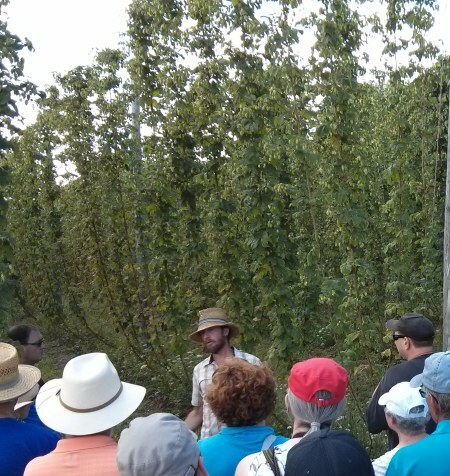 Nicholas Schaut explains the magic of hops at the Bighead Hops ShinDig. The screening of Selma at the Meaford International Film Festival (MIFF) will be enhanced by a rarely seen exhibition of photos taken during this pivotal period in the American civil rights movement. 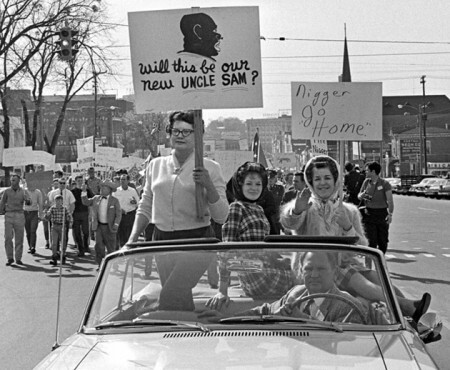 Lynn Ball was freelancing in the darkroom at Canadian Press Toronto in the late winter of 1965 when he heard about the upcoming third march from Selma to Montgomery. Knowing it would an historic event, the aspiring news photographer packed his gear into his car and drove to Alabama, where he took a series of astonishing photos that sat in a drawer for the next 50 years. Ball says that some of the photos were considered too controversial or racially charged to be published at the time by American, and even Canadaian, news organizations. “AP [Associated Press] sent out the pictures and then immediately sent out a kill order on them,” he told the Kemptville Advance. These included photographs of white demonstrators in opposition to the march – images which still have the power to shock today. Some of Ball’s film was still undeveloped in a drawer until earlier this year. The 50th anniversary of the Selma march prompted Ball to develop and organize a photo essay, which premiered in Merrickville, Ontario in March. The exhibit, along with a recorded interview with Lynn Ball, is currently being displayed by the Emancipation Festival at the Grey Roots Museum in Owen Sound. MIFF’s special exhibit is thanks to the efforts of Blaine Courtney, Emancipation Festival Chair. MIFF will also feature an additional exhibit from the Festival and Clarksburg’s Sheffield Park Black History Museum about their efforts to preserve and explore the black experience in Grey Bruce.